On Friday, March 14, 2003, Jim Oldfield suffered a heart attack, was brought back and survived triple bypass surgery, physical rehab and succeeded in changing his lifestyle from an overweight, unhealthy 200 lb. plus smoking “couch potato” to an Ironman® competitor in a few short years. Jim has been called an athlete, an inspiration and a “heart hero” and has been fortunate to be awarded American Heart Assoc.’s Heart Hero of the year and has won the AHA Lifestyle Change Award, twice. Over the past five years, Jim has participated in raising funds and awareness of cardio vascular disease (CVD) through active participation in various sporting events. Jim has run and raced dozens of 5K to 25K races, ½ marathons, marathons, cycling time trials, century rides, aquathons, bike-a-thons, duathlons, sprint triathlons, Olympic distance triathlons and 19 Ironman™ 70.3 mile and Ironman™ 140.6 mile endurance races; all since 2005. In particular, the Ironman™ distance races consist of swimming 2.4 miles, cycling 112 miles and running 26.2 miles (a marathon) all within 17 hours and is considered the most difficult single day sporting event in the world. Jim has appeared in numerous local, regional and national newspaper and magazine articles and has been featured in several videos, including being spotlighted in the nationally televised Ironman™ Florida’s 2010 Ramp-up Show. 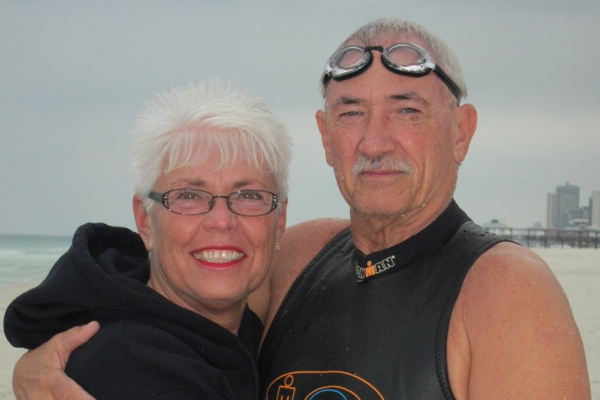 Through the Ironheart Racing™ Team and Ironheart Foundation, Jim inspires other athletes to make a difference in the lives of heart survivors. Jim is also one of the Ironman™ competitors ‘in training’ to be featured in an upcoming documentary film Heart: Flat line to Finish line. It is a 90 minute documentary of 7 athletes with heart-related issues; all training to compete and finish ‘the most difficult single day sporting event in the world’, Ironman. Today, Jim keeps himself physically fit, nutritionally balanced and spiritually alive through his daily training regiments. With the help and encouragement of doctors, surgeons, trainers, therapists, nutritionists, friends and, most importantly, family, Jim is an example of what is possible through great attitude, good nutrition and structured, purposeful exercise. Jim shows us that you can reach beyond your dreams and your perceived physical and mental limitations; there is no limit to what you can accomplish; no matter your age, size, status in life or the size of your heart. No matter what, you can do it.